In the spring of 2003 at the age of 72 years, Robert Atkins, the cardiologist and controversial promoter of high fat diets for weight loss, fell on the sidewalk in front of his Atkins Center for Complementary Medicine in Manhattan. He lost his footing on a patch of ice, slipped and banged his head on the pavement. At the time of his fall his book ”Dr. Atkins’ New Diet Revolution” lead the NY times paper-back best seller list. He was taken to nearby Cornell Medical Center where a clot was evacuated from his brain. Thereafter he lapsed into a coma and he spent 9 days in the ICU, expiring on April 17, 2003. An epidural hematoma is a collection of blood between the skull and the tough outer lining of the brain (the dura) which can occur with blunt trauma to the head which results in laceration of the arteries in this area. It is a not uncommon cause of death in trauma . Actress Natasha Richardson (skiing, see below) died from this. Nothing about the manner in which Robert Atkins died would suggest that he was a victim of his own diet any more than Natasha Richardson was. However, within the year a campaign of misinformation and deception spear-headed by evangelistic vegans would try to paint the picture that Atkins died as a direct result of what they perceived as a horribly dangerous diet. Richard Fleming, a physician promoting prevention of cardiovascular disease through vegetarianism and with close ties to an organization called Physicians Committe for Responsible Medicine (PCRM) sent a letter to the NY Medical Examiner requesting a copy of the full medical examination of Atkins. The NYME office should have only issued copies of this report to physicians involved in the care of Atkins or next of kin but mistakenly complied with this request. Fleming, who would subsequently publish his own low fat diet book, conveniently gave the report to PCRM which is directed by animal rights and vegan physicians. 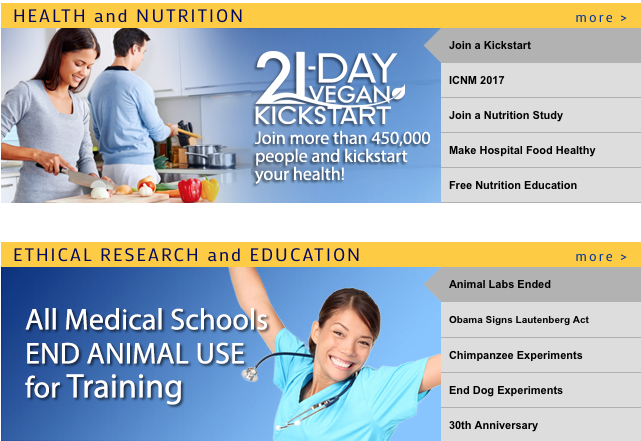 From the front page of pcrm.org. The two major concerns of the group are converting everyone to veganism and animal rights. Neal Barnard, the President of PCRM, in an incredibly unethical move sent the letter to the Wall Street Journal with the hope that the information would destroy the popularity of the Atkins diet, a diet he clearly despises.. Barnard said the group decided to publicize the report because Atkins’ “health history was used to promote his terribly unhealthy eating plan..” The WSJ subsequently published an article summarizing the findings. To this day, advocates of vegetarianism and low fat diets, distort the findings of Atkins’ Medical Examination in order to depict high fat diets like his as dangerous and portray Atkins as a victim of his own diet. To scientists and thoughtful, unbiased physicians it is manifestly apparent that you cannot base decisions on what diet plan is healthy or effective for weight loss on the outcome of one patient. It doesn’t matter how famous that one person is or whether he/she originated and meticulously followed the diet. It is a ludicrous concept. Would you base your decision to engage in running based on the death of Jim Fixx? Fixx did much to popularize the sport of running and the concept of jogging as a source of health benefit and weight loss. He died while jogging, in fact. An autopsy concluded that he died of a massive heart attack and found advanced atherosclerosis (blockage) of the arteries to his heart. Fixx inherited his predisposition to heart disease and couldn’t run himself out of it. Multiple studies over the years have documented the benefit of regular aerobic exercise like running on longevity and cardiovascular risk. Would you based your decision to engage in a very low fat diet based on how Nathan Pritikin died? Pritikin authored an extremely popular book emphasizing eliminating fat from the diet but developed leukemia and slashed his wrists, committing suicide at the age of 69 years. Would vegetarians accept the premise that their preferred diet results in leukemia or suicidal depression based on Pritikin’s death? 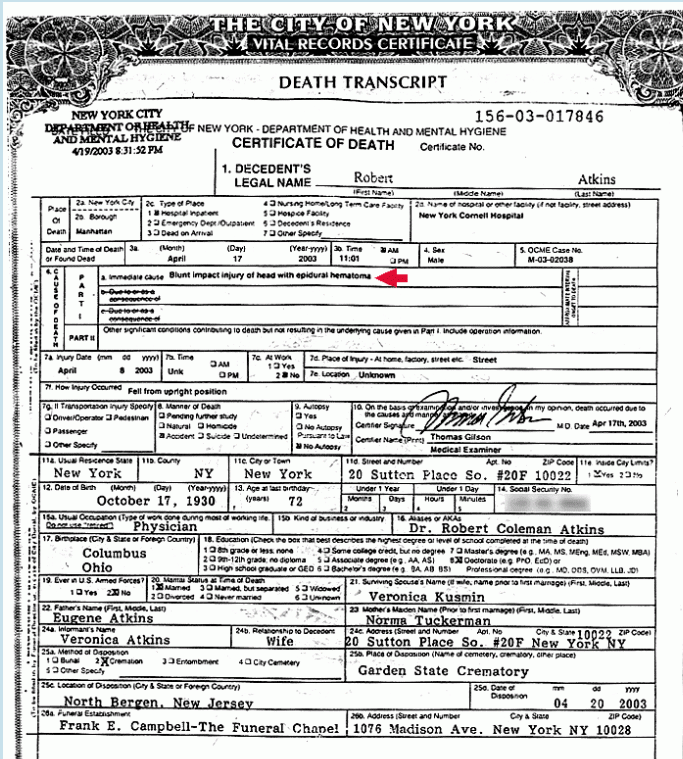 The NYME report lists Atkins weight at autopsy as 258 pounds. Low-fat zealots seized on this fact as indicating that Atkins was morbidly obese throughout his life. 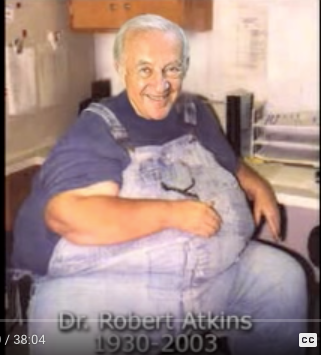 For example, a you-tube video of an audio interview of Atkinas online posted by “plant-based coach” has this obviously photoshopped head of Atkins put on the body of a morbidly obese man. Atkins actually weight around 200 pounds through most of his life and a hospital note on admission showed him weighing 195 pounds. A substantial weight gain of 63 pounds occurred in the 9 days after his admission due to the accumulation of fluid volume and swelling which is not uncommon in the critically ill.
MI is the acronym for a myocardial infarction or heart attack. 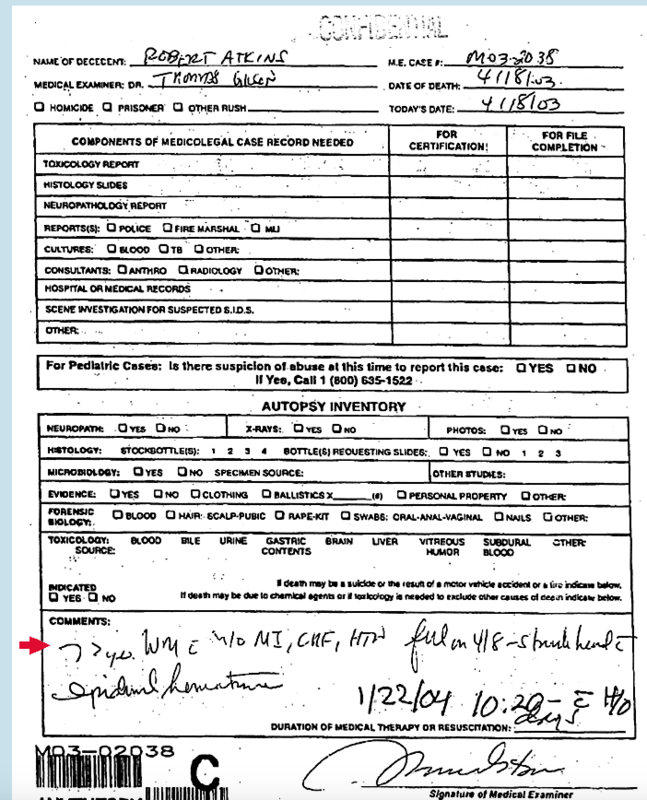 As far as we can tell without access to full medical records, Atkins never had an MI. He did have a cardiac arrest in 2002. While most cardiac arrests are due to a cardiac arrhythmia secondary to an MI they can also occur in patients who have a cardiomyopathy or weakness in the heart muscle from causes other than MI. In fact, USA Today reported that Stuart Trager, MD, chairman of the Atkins Physicians Council in New York, indicated that Atkins was diagnosed with a cardiomyopathy at the time of his cardiac arrest and that it was not felt to be due to blocked coronary arteries/MI. Cardiomyopathy can be caused by viral infections or nonspecific inflammation of the heart muscle and would have nothing to do with diet. Trager also stated that Atkins, as a result of the cardiomyopathy, had developed heart failure (CHF) and the pumping ability of his heart (ejection fraction )had dropped to 15 to 20%. While CHF can be due to heart attacks causing heart weakness in Atkins case it appears it was unrelated to fatty blockage of the coronary arteries causing MI and therefore not related in any way to his diet. The information about Atkins death tells us nothing about the effectiveness or dangers of his diet. In one individual it is entirely likely that a genetic predisposition to cancer or heart disease overwhelms whatever beneficial effects the individual’s lifestyle may have had. Thus, we should never rely on the appearance or the longevity of the primary promoter of a diet for the diet’s effectiveness. The evangelists of low-fat, vegan or vegetarian diets like PCRM have shamelessly promoted misinformation about Atkins death to dismiss high fat diets and promote their own agenda. If their diets are truly superior it should be possible to utilize facts and science to promote them rather than a sensationalistic, distorted focus on the body of one man who slipped on the ice and fell to his death. Addendum: Earlier versions of this post cited MLB pitcher Brandon McCarthy as a victim of a fast ball to the head causing epicardial hematoma. I was corrected by astute reader Fred N who pointed out that McCarthy is still pitching for the Dodgers and was hit by a line drive (off the bat of Erick Aybar). McCarthy had emergency surgery for the epicardial hematoma in 2012. His diet had nothing to do with the epicardial hematoma. “Natasha Richardson fell in a beginners trail while taking a ski lesson at Station Mont Tremblant,” the statement said. “She was accompanied by an experienced ski instructor who immediately called the ski patrol. She did not show any visible sign of injury but the ski patrol followed strict procedures and brought her back to the bottom of the slope and insisted she should see a doctor. The last time I skied I found myself falling and banging my head an extraordinary amount. If I ever ski again (in contrast to my resistance to bike helmets) I plan to wear a helmet. The skeptical cardiologist spent an interesting week in ketoland, counting carbs, and turning ketostix purple, but ultimately decided this was not a world he wanted to inhabit long term. 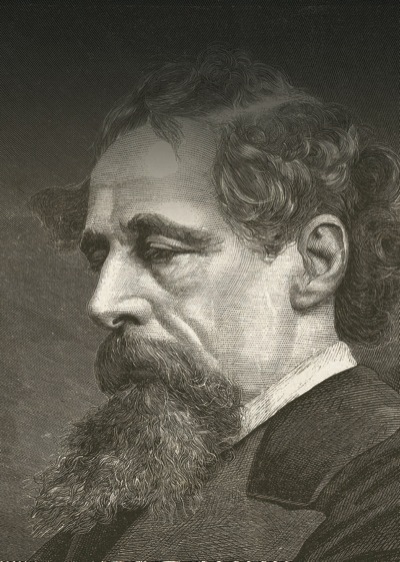 Charles Dickens, twice President of the Printer’s Pension Society and also did some writing. 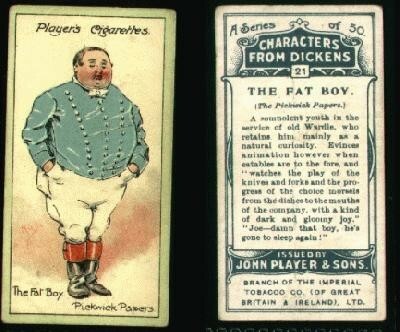 In the Pickwick Papers, he describes Joe, the Fat boy, who was perpetually falling asleep. Pickwickian Syndrome was the early medical term for what is now sleep apnea. In my last post, I closed with a paragraph describing the benefits I had experienced of consuming a really high fat, very low carb diet: more energy, less sleep needed, asthma cured, wrinkled skin “melting away. This was supposed to be a humorous parody of how enthusiastic supporters of fad diets feel after they have jettisoned their bad eating habits but apparently most readers, unaware of my dry sense of humor (or perhaps not familiar with David Cronenberg’s The Fly) took this seriously. 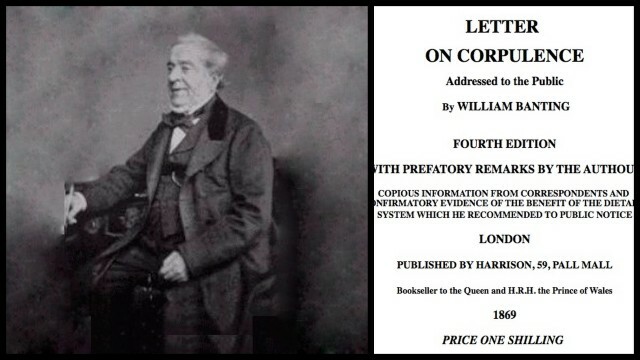 Certainly, if I had felt significantly better on the Atkins diet I, like William Banting, would still be on it. Alas, if anything, I felt worse. My sleep was unaffected. Unllike, Robert Atkins, who noted his sleep requirements went from 8 hours a night to 5 hours a night, my sleep patterns were unchanged. Energy levels in the morning were good but periodically in the afternoon, especially after even minor exertion but particularly after an intense workout, I would feel uncharacteristically exhausted. Although my weight dropped 3-4 pounds this is typically what happens if I cut out alcohol from my diet for a week so it’s hard to say what the independent role of the extremely low carb intake and ketosis was. My blood pressure dropped during the week and I had to cut back on my blood pressure medications to avoid dizziness. There were too many other variables occurring simultaneously that week (weight loss, lack of alcohol consumption) to know if this was independently associated with the ketogenic diet, however. To be fair, supporters of ketogenic/Atkins diets warn us that during the initial weeks, we may feel worse, experiencing the so-called “low carb flu.” To fully test it I should have stayed on it for 3-6 weeks and entered a maintenance phase in which I could have consumed more carbohydrates. However, after a week of having to analyze in detail the carb or net carb content of everything that I consumed, I realized this was not something I wanted to do long term. For the significantly obese like William Banting who struggle to achieve weight loss the ketogenic/Atkins diet is likely to be a much better experience than for someone like me who is not overweight. Banting’s diet prior to his “miraculous change” consisted primarily of bread, milk and beer and it is likely that cutting out the bread and beer alone would have had a dramatic effect on his weight and well-being. My adventure in ketoland inspired me to update my dietary recommendations , the pdf of which is here (What Diet Is Best For Heart Health). It would nice if we had some sort of genetic test that would tell us what diet is perfect for us. Unfortunately, until that is developed, trial and error is the only viable approach. Some, like William Banting, Robert Atkins and the lady at zerocarbizen.org will thrive on very low carbs whereas others, like Dean Ornish and Nathan Pritikin prosper on a very low fat diet. Most individuals will be served best by a diet of real, minimally processed food with lots of different vegetables growing both above and below ground and eaten in moderation. In the name of research and inspired by reading a biography of Robert Atkins, a few days ago the skeptical cardiologist embarked on an ultra low carb diet designed to put him in a state of ketosis. When the body shifts to utilizing fat for energy rather than glucose, the result is the production of ketone bodies which can be detected in the urine by use of a ketostick. When your urine turns the stick purple, you have become ketotic and have successfully kept your carbohydrate intake low. Entering ketoland, as I like to term it, is not for the faint of heart. It requires a fanatical devotion to the LCHF pope, a steely determination, and meticulous monitoring of your food for anything that resembles a dreaded carb. My first experience of ketosis was as a third year medical student on the vast, communal wards of St. Louis City Hospital. Here, the teeming indigents, the IV drug abusers and the criminals of the city came to share graciously their noxious diseases with we innocent disciples of Hippocrates. Amongst the patients with AIDS and endocarditis, pheochromocytoma and Mallory-Weiss syndrome, there were many insulin-dependent diabetics who, for themselves, poorly did care or who had decompensated due to infection. Emanating from their mouths and other orifices, I, not uncommonly, noted a peculiar odor. It smelled like pear drops or ripe apple or perhaps, (had I been familiar with it at the time) nail polish remover, and was quite distinctive. Most of my fellow students could not smell it and relied on blood or urine tests to confirm what I had already detected-KETONES! These diabetics had gone into diabetic ketoacidosis (DKA), a life-threatening complication and I was smelling acetoacetic acid. Peter Attia has written eloquently and interestingly about the difference between DKA and nutritional ketosis here. You can only get the dangerous type of DKA if you are unable to produce insulin like type I diabetics. I’m pretty sure that,to this day, there are many doctors who only think of DKA when they hear the term ketosis. The ketoland I have entered is not pathological: Atkins and, increasingly in the last decade, evidence-based and academic nutrition scientists, believe that ketosis may be a healthier state for our body to be in, free of wildly fluctuating, inflammatory insulin cycles. The cost of admission, however, is eschewing all bread, pasta, rice, potatoes, sugar-sweetened beverages, pastries, processed foods and, obviously, candy…that’s right out. The tantalizing part of the diet is that it does not restrict your intake of fat in any way. In fact, to have your ticket punched into ketoland you must seek out fat in as pure a form as possible. This morning, for example, I made myself a cup of coffee and adulterated it with heavy whipping cream (0 carbs, 50 calories of fat). Before leaving the house I took two boiled eggs and mixed them with mustard and safflower oil mayonnaise (30 grams of fat, no carbs) to eat later in the day. I eat burgers, no fries, no buns, and I carry with me macadamia nuts, sunflower seeds, and almonds. I bought a huge jar of coconut oil and eat it by the teaspoon. An Atkins-aware dinner for me meant including my laptop with software to calculate the amount of carbohydrates per serving and measuring cups to precisely measure out the sour cream, guacamole and tex-mex low carb casserole portions. Kudos to the eternal fiancee’ for seemingly tolerating all this. Ketoland is foreign territory for most of us. I had to enter foods into the myfitnesspal app to help me determine what the carbohydrate contents were. I found myself paying close attention to portion size, not for the calories, but to help me better estimate how many carbs I was consuming. For example, I thought that cauliflower would be a good snack, but 4 pieces of cauliflower cost me almost 5 carbs. After 12 hours, during which I consumed 123 grams of fat, and only 26 grams of carbohydrates, my ketostick turned purplish. What is it like in ketoland? Well, for one thing I only need 4 hours of sleep. Asthma, which has plagued me all my life, is now nonexistent. Wrinkles have melted from my face, like wax from a burning candle. I have boundless energy. The best comparison I can come up with is the transformation Jeff Goldblum underwent in David Cronenberg’s (1986) The Fly. Come to think of it, he was probably also on a LCHF diet. Hopefully, I won’t experience his complete transformation. Seriously, I think it is too early to tell whether the tediousness of this diet will be worth it for me, but if I can last for a few weeks, I will have some good anecdotal short-term data to share with my patients on the diet’s effects on weight, energy, hunger, and personality. If you are wondering why we make ketones, here’s a simple answer from Peter Attia. For starters, it’s a vital evolutionary advantage. Our brain can only function with glucose and ketones. Since we can’t store more than about 24 hours worth of glucose, we would all die of hypoglycemia if ever forced to fast for more than 24 hours. Fortunately, our liver can take fat and select amino acids (the building blocks of proteins) and turn them into ketones, first and foremost to feed our brains. Hence, our body’s ability to produce ketones is required for basic survival . If you’d like to watch a very well done 11 minute video on low carb high fat diets click here. You have to give an email address, which will send you Andreas Eenfeldt’s Diet Doctor updates. His site is very well done, free of ads and free of any industry influence. You should be able to watch his diet revolution video, full of Swedish humor here.